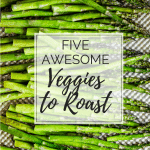 Check out these five best vegetables to roast! Change the flavor profile of these popular veggies just by roasting them in a high-heat oven! My go-to side dish for both weeknight meals and weekend feasts is a tray of crispy and caramelized roasted veggies. I serve them hot out of the oven in winter or tossed in a salad for summer meals. I love that you don’t really need a recipe. Just toss them with high quality olive oil, sea salt and black pepper. Or go a little crazy and experiment with spices or fresh herbs. After you get your veggies under some high heat, the edges start to caramelize and crisp up and the interior is sweet and tender. There’s nothing better! Make sure not to overcrowd your veggies, otherwise you’ll end up steaming them. If you don’t eat them all at once, use your roasted veggies for meal prep throughout the week. 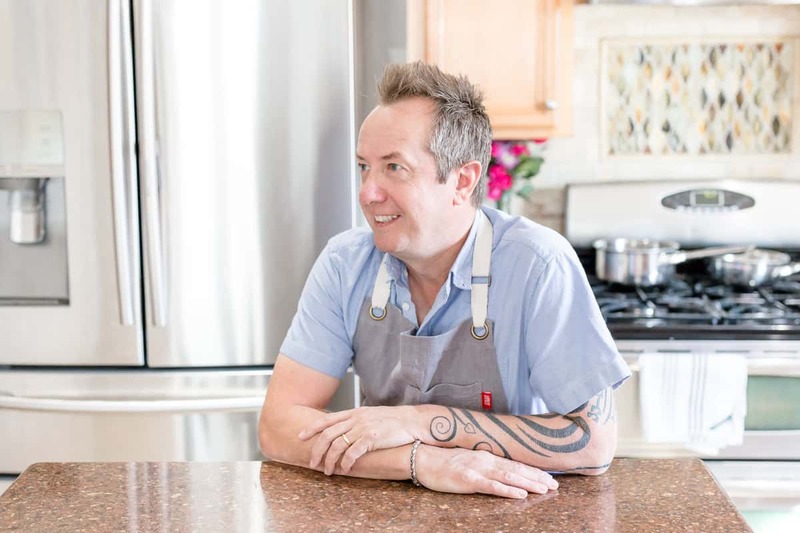 I’m sharing my five best vegetables to roast and my favorite ways to prepare them below. 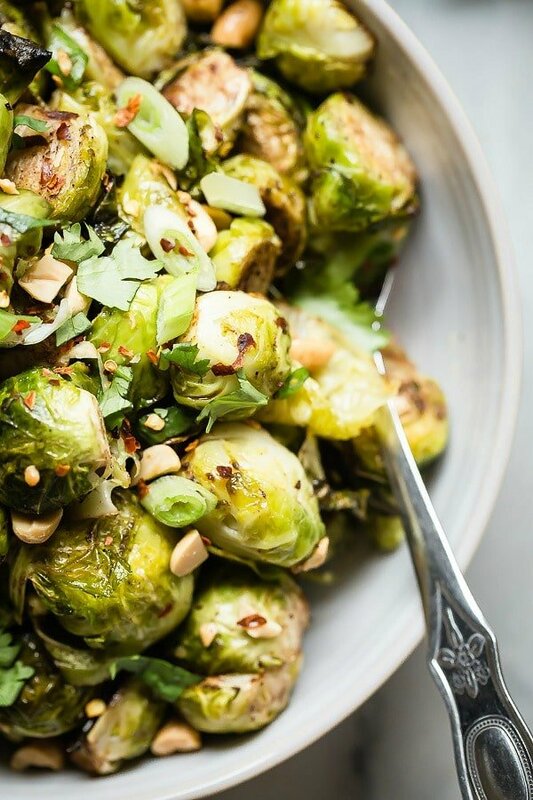 You haven’t lived until you’ve tried roasted Brussels sprouts. Not to be confused with the mushy boiled or steamed versions, roasting turns these mini cabbages into a whole new culinary experience. Roasting caramelizes and crisps up the edges and brings out the sweetness of the interior. Brussels sprouts gained popularity in Belgium and are named after the capital, Brussels. They’re in the same botanical family as broccoli and kale, and grow on thick stalks studded with green edible sprouts. It’s really important not to roast Brussels sprouts too close together on the pan or they’ll end up steaming and turning to mush. Brussels taste amazing with a simple preparation of olive oil, salt and pepper, but my favorite way to serve them is roasted, then tossed with a buttery thyme spread. I garnish with crumbled cojita cheese and it’s pretty epic. Sometimes I go a little crazy with the roasting and add a five spice hoisin sauce for Vietnamese flavor. Brussels sprouts also pair well with diced bacon and a balsamic glaze, and I’ve also gone with garlic and parmesan for a mouthwatering combo. Brussels sprouts can be stored in a plastic produce bag in the fridge for over a week. If you can find them on the stalk, they’ll stay fresher for longer. Store the stalks in fresh water, like you would a bouquet of flowers, and cut off each sprout with a paring knife when ready to use. To Prepare, remove damaged leaves, rinse under running water, apt dry, trim off the hard ends and halve. Roast, cut side down, in a 425°F oven for 25-30 min. Broccolini is common in Japan and is usually steamed or stir fried, though roasting in the oven gives it a soft texture but still left some bite. The leaves, florets and stalks are all eaten, so you’ll find them in leafy bunches at the grocery store. Although the florets resemble broccoli, they are smaller and sweeter tasting than regular larger broccoli florets. I love that roasting crisps up the tips of the leaves. 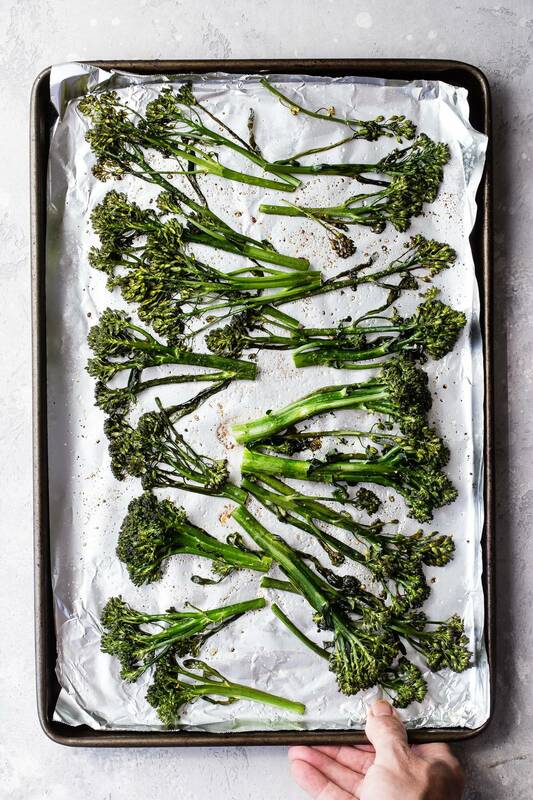 A simple preparation of olive oil, lemon juice and salt allows the nutty flavor of broccolini to shine when roasting. Another variation is to add lemon zest, shaved parmesan and pine nuts. I serve roasted broccolini with pasta, seafood or grilled meat. When buying broccolini, make sure the leaves are not wilted and the florets aren’t yellow, as this indicates plants that are past their prime. Store broccolini in a plastic produce bag in the vegetable crisper for 3 to 5 days. Before roasting, wash the plants and trim off the base of the stem. Roast broccolini at 375°F for about 10 minutes. Butternut squash has been around for over 10,000 years, cultivated by Native Americans in north and central America. These days some grocery stores sell already peeled and diced butternut squash and it can be found in the frozen section too. So if you’re short on time but still want the sweet taste and health benefits of butternut squash, convenience is the way to go! But it’s not that hard to prepare a whole butternut squash, and I love that it stores for a long time in the kitchen pantry due to the hard outer skin. 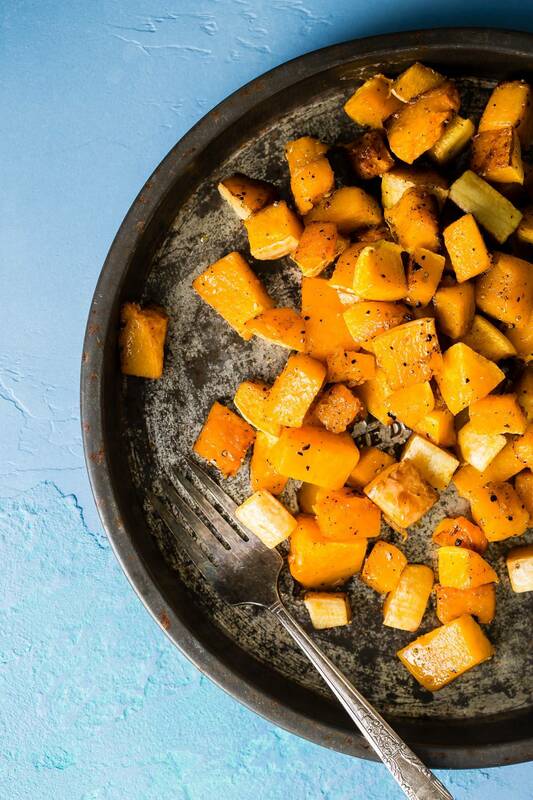 Roasted with olive oil, salt and pepper, butternut squash has a sweet, nutty flavor that I associate with fall and winter even though I use it year round. A little extra spice only makes it better. Try adding cumin, cayenne pepper, or garam masala. Sometimes I’ll go in the sweet direction and toss cubed squash with maple syrup or brown sugar and cinnamon. After roasting I’ll either serve it as is or mash it and add it to a sauce or as an ingredient in tacos or enchiladas. I also toss it in soups and salads. Look for a butternut squash that doesn’t have bruises. A squash that has a long neck and small bulb will have more meat. Butternut squash can be stored in a cool dry place, like a pantry, for months. To prepare, wash first, dry, then cut both ends off with sturdy, sharp knife. Peel the thick skin with wide peeler. Stand the squash upright and cut in half lengthwise. Scoop out the seeds and stringy pulp. The seeds can be roasted the same way you would roast pumpkin seeds. Cut the squash into long 1-2” strips, then dice into 1” cubes. Roast at 400°F for 30-40 minutes or until fork tender. If you’ve never had roasted asparagus, it’s time to try it. Asparagus takes 3 to 4 years from planting seed to harvesting edible spears. If we didn’t harvest the spears, the plant would grow into a giant fern-like plant. White asparagus is basically the green variety that hasn’t been exposed to sunlight. It’s grown under soil and each spear is hand-picked and stored in a dark box, making the taste mellower than the green variety. There’s no way anyone will turn down roasted asparagus when it’s topped with a little chopped bacon. That’s what I do to get my kids to eat it, but I’ll take it simply roasted with olive oil and salt, or on a sheetpan next to some salmon steaks anyday. I also love roasting it with lemon juice and garlic, then sprinkling on some shaved parmesan cheese when it comes out of the oven. 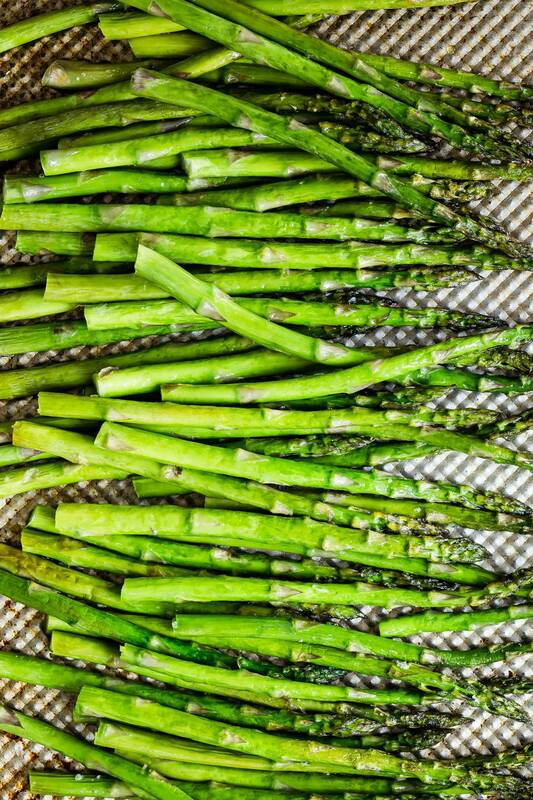 You can find asparagus in the produce aisle from March through June. Look for bright green color and compact heads that aren’t mushy. Thicker stalks hold up better to roasting. You can store asparagus in a plastic produce bag or extend the life and store it tips up in a glass of shallow water. It will last about a week this way. To prepare, wash the spears under running water, pat dry, and trim the ends of the stems off. You can do this with a knife or by holding the ends and bending the spears until the ends break off. It doesn’t take long for asparagus to get tender in the oven. Roast at 450°F for 5 to 10 minutes depending on thickness. Carrots get their orange color from beta carotene, but carrots can also be white, blue, purple, red or yellow. Carrots are root vegetables, and they get sweeter in the garden at maturity when the days are warm and the nights are cool. Roasting brings out the natural sweetness even more, and it’s a delicious way to prepare carrots. If you want a visually stunning side dish, grab a bunch of rainbow carrots at your local farmer’s market or grocery store. 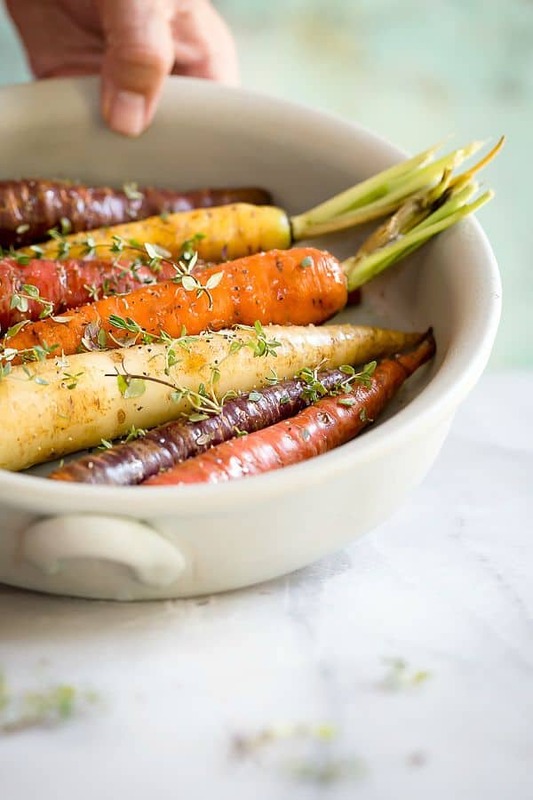 My favorite way to wow is to roast up a batch of rainbow carrots with some olive oil, a drizzle of honey, salt, pepper and fresh rosemary. They’ll be gone in seconds. All it really takes for simple roasted carrots is some olive oil, salt and pepper. Go a little crazy and add cumin, turmeric, chili powder, curry or cinnamon. You can even boost the sweetness with a drizzle of honey or maple syrup. Fresh herbs sprinkled on top also increase flavor. From carrots with tops to rainbow colored to baby carrots, there are many choices in the market. You can store carrots with the tops on and cut them off before preparing. Store carrots in a plastic produce bag in the vegetable crisper. Carrots can be stored for up to a month in the fridge. Before roasting, wash and pat the carrots dry. There’s no need to peel them, but you can if you prefer. Toss with olive oil and spices and roast at 400°F for about 20 minutes or until fork tender. 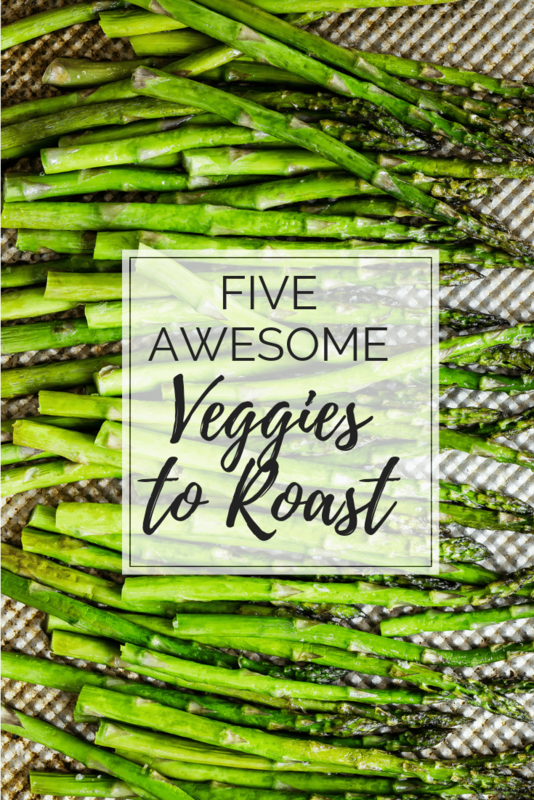 Check out these roasted veggie recipes I think you’ll love!